Brenda Huettner is currently a technical writer and webmaster for Microwaves101.com, owner and president of P-N Designs, Inc., a senior member of IEEE, and an STC Fellow. She has a variety of experience including usability, accessibility, and web design. For technical communicators, accessibility is a topic that appeals to the principles of professionalism, quality, and legality. In a storied career that includes web design, technical writing, usability and accessibility consulting, Brenda Huettner constantly focuses on a central tenet—advocating for the user. Her experience in usability and accessibility gives her a unique perspective on developing content for users. In this interview, we hope to clarify myths and misconceptions technical communicators often hold about accessibility guidelines. Brenda Huettner is primarily a technical writer, and, as a technical writer, she has always been an advocate for users. “The minute you try to use something,” Brenda says, “you are experiencing usability!” In her world, usability, accessibility, and web design pretty much encompass everything. Surprisingly, 65% of the population has some sort of disability that may influence how they interact with documentation or interfaces. For example, it’s easy to identify a large number of people who have trouble reading fine print. Brenda believes keeping the user in mind is important for many business reasons, such as the potential implications of accessibility strategy to the organization’s sales/marketing and legal departments. According to Brenda, the organization’s strategy for accessibility has sales implications. “From a business standpoint, why would you want to exclude any percentage of your potential audience? If I can sell even a small percentage more widgets by making my product accessible, the ROI is easy to calculate.” Designing for accessibility helps technical communicators include more potential audience and increase profits. Increasingly, a strategy for accessibility also has legal implications. “From a legal standpoint, we have ADA regulations. The biggest example, of course is the Target case, where their refusal to make their site accessible to the blind landed them in court (and they lost).” Ensuring e-commerce websites are accessible will help prevent companies from being subject to expensive legal actions. The Target case that Brenda cites occurred in 2006, when the National Federation of the Blind filed a class action lawsuit against the Target Corporation. The claim that blind people could not purchase items from Target’s website independently and that that fact violated the Americans with Disabilities Act of 1990 (ADA) was upheld by the courts. This case set a precedent for the ADA regulations applying to e-commerce websites. 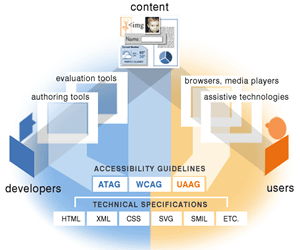 Technical communicators should have and follow accessibility guidelines. However, contrary to what many technical writers may believe, the idea that accessibility guidelines increase usability for everyone is an overgeneralization. “Accessibility guidelines alone do not increase usability, but compliance with guidelines often does,” Brenda explains. 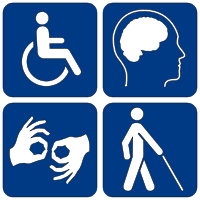 To further illustrate the concept of compliance with versus mere presence of guidelines, Brenda comments on the top things to remember about accessibility guidelines. “First, there are lots of types of disabilities – including temporary ones like loss of mobility due to, say, a broken bone. Or situational things like working on a factory floor where there is too much noise to hear a laptop tone, or in a place with too little light or too much glare that can impact visual issues. “Secondly, accessible content tends to be easier to translate, and even if not translated, it tends to be easier for non-native speakers to understand and use.” In other words, making content accessible to people with disabilities may make content easier to understand overall, whether or not it is translated. In fact, the accessibility balancing act has been around for many years, getting some of its impetus from the 1998 Section 508 amendment to the Rehabilitation Act of 1973. Brenda believes that Section 508 is pretty straightforward, and serves as a good set of guidelines. However, “the thing that most people don’t realize is that the law does NOT say that everyone must comply with 508.” The law actually states that “the U.S. government won’t purchase technologies that aren’t compliant.” Therefore, only organizations that sell to the US government must comply with Section 508. Thatcher, Jim et al. Constructing Accessible Web Sites. Apress, 2003. Paciello, Mike. Accessibility for the Web. CRC Press, 2000. Author’s Note: I’d like to thank Brenda Huettner for taking the time to answer my questions. I’ve learned a lot from this interview. Accessibility is a fundamental part of technical communication. As we design our documents, web pages, and other media, technical communication professionals have a responsibility to consider how to create content that is accessible to as many users as possible. Originally published on January 7, 2013, at Tech Writer Today Magazine (http://techwhirl.com/technical-communication-accessibility-brenda-huettner-interview/).